I would like you to conduct a little experiment with me. Take a piece of paper and a pen, and (without googling it!) write down how many species of bee you think there are in the UK and Ireland. If you already know it, then great – you will probably already know where this is going. All done? Wonderful! I’ll reveal how many species there are later on in this article. As I am sure many of you are aware, international populations of Apidae (the family bees belong to) are in serious decline. Conservationists, bee keepers and farmers are fighting to secure the future of pollinator populations, with species losses threatening many aspects of society and agriculture. Extreme collapses in domestic honeybee numbers (colony collapse etc.) coupled with the damage to native bee populations have meant that attitudes towards these groups have changed. The serious misuse of pollinators has meant that in some regions food crops have been left unharvested. Indeed, in China alone there is such a drastic collapse in the natural pollinator levels that farm workers have been employed to use paintbrushes to manually pollinate flowers on fruit trees, to make up for the natural lack of insect life. Figure 1. 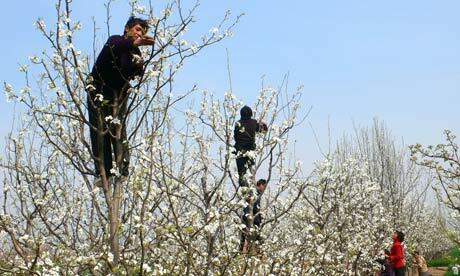 Chinese workers hand pollinating apple blossom. What is a bee, and why should you care? Bees are technically specialised wasps, evolving to take advantage of the advent of pollen and nectar from flowering plants in the early Cretaceous some 100 million years ago. Amusingly, some solitary wasps (another chronically overlooked group) are more closely related to bees within the superfamily Apoidea than the social wasps (the ones that steal your cakes in a picnic). 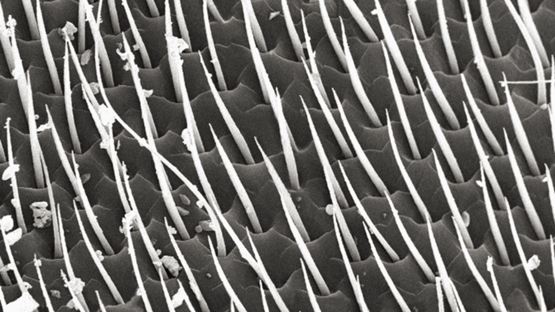 Physiologically, bees differ from closely related groups such as wasps by having branched or plume-like setae (bristles), combs on the forelimbs for cleaning their antennae, small anatomical differences in the limb structure and the venation of the hind wings, and in females, by having the seventh dorsal abdominal plate divided into two half-plates (woo!). In the UK alone, the services bees provide is estimated to be in excess of £200 million, and a commercial value of £1 billion, and in a struggling farming industry that is a very serious amount of money. Varroa mites, colony collapse, agricultural intensification, climate change and enhanced chemical pesticides (I’m looking at you Neonicotinoids [although that’s a debate for another time]) are all contributing to this vital groups collapse, and without intervention there will be serious repercussions both for society and the natural world. Einstein is often misquoted in having said: “If the honeybee disappeared off the surface of the globe then man would only have four years of life left. No more bees, no more pollination, no more plants, no more animals, no more man.” A statement that is very far from the truth. Over 65% of all crops produced now self fertilise or do not need fertilisation, requiring little to no insect contact, and the remaining 35% can largely be made up of the 19,993+ other bee species that are not honey bees (of which there are only 7 worldwide). Though it is unquestionably true that bees contribute an invaluable service to the farming industry, there has been a conscious movement of funds towards certain taxa by controlling of the funds allocated to address this by invested parties. Think for a second of the honeybee. Idolised as a pinnacle of mans peaceful communion with nature, they are viewed by the masses as tiny saviours, tirelessly working away to fertilise crops and produce delicious honey. The reality of this, is very different. As their name suggests, honey bees do, in fact, produce honey for us to enjoy. However, the pollination aspect of these false agricultural gods can be considered substandard to detrimental at best. It is estimated that a single carpenter bee has the ability to pollinate a hundred times more plants than the equivalent honey bee, due to the way the honey is extracted. Honey bees visit flowers for long periods of time, and visit few in number for each visit, taking more ‘wet nectar’ from an individual flower than solitary bees do. Solitaries on the other hand, use a variety of techniques to attain their honey, typically spending a smaller amount of time on each flower, but visiting many many more than the honey bee would. This dramatically increases the rate of pollination, and a single red mason bee can pollinate up to the equivalent of a hundred and twenty honeybees worth of flowers in its lifetime. So why are we prioritising honeybees? Honeybees have also been found to make use of a technique carried out by the ‘short tongued bees’ to bypass the need to carry pollen. Short tongued bees nibble a hole into the base of a flower’s corolla (petals), in what is known as primary nectar robbing, and stick its short tongue inside to get at the delicious nectar, without ever having to enter the flower and get covered in pollen. Though it is unclear as to whether honeybees are able to make these holes themselves, they have been recorded using the holes made by other bee species, in what is known as ‘secondary nectar robbing’. The primary nectar robbers are usually found in low densities, having little impact on total floral fertilisation, but this process further exacerbates the already substandard capabilities of honeybees to pollinate flowers. Honey bees have also been recorded to steal pollen from the pollen sacs of bumblebees on a surprisingly frequent basis, latching onto their backs and extracting their quarry as part of a team of several bees or more. This research is in its early stages however, and further work is needed to back this up. Many organisations that want to focus on honeybees (I am not naming any names about British beekeepers) have used the honeybee as the poster child of the crisis in the countryside, and whilst there has been some research into how to best manage for other, more crucial pollinator species, it is dwarfed by the funding for honeybee pollination. This misplacement of funds damages the conservation of solitary bees, and undermines the initial focus of wanting to increase and stabilize pollination rates in the agricultural environment. It has been shown that regardless of honeybee presence, solitary bees significantly increase the pollination rates in fruit trees and arable crops, and do so to an even higher degree with the presence of honeybees removed. Would it not be better therefore to incentivise the creation of solitary bee habitat and the removal of hives (as well as offsetting the loss of honey production) in order to both bolster arable production and protect our native bee diversity? I think the main reason why honey bees are prioritized over our native, more crucial pollinators is because of our history with them. The Pharaohs of ancient Egypt would offer honey to the gods, and the archetypal Victorian gentleman could oft be seen about his hives. It will be important in the coming years to objectively dissociate ourselves from the domestic honey bee, in order to better focus on the conservation of the Two Hundred and Forty Eight other species of bee found in Britain and Ireland. Did you guess correctly? I imagine you said something a little over a hundred – possibly less. I can’t even find how many of these species are nationally and internationally red listed, but hopefully this is something that will be elaborated on in time. In essence, we need less focus on honeybees, and more focus on solitary bees. Which brings me in a very roundabout way to the question at hand – Do solitary bees need rebranding? The term ‘solitary bee’ is not warm and soft like that of a bumblebee, or evocative of hives and honey like that of a honeybee, but are in desperate need of attention and research. A more socially acceptable and softer term might just be the solution this group of charismatic animals needs in order to lift it out of the proverbial academic gutter. I have tried to come up with a few names and suggestions, but they really do need a better image to project their conservation. Okay, okay, obviously some of those are a joke, but they are more likely to grab peoples attention than the morose title of ‘solitary’ which leaves people pining for bumble and honey bees. In the same way the rediscovered Santiago Rice Rat (Nesoryzomys swarthi) was rebranded during a conservation fundraiser to the ‘Santiago Nibbler’ to gain support, I feel solitary bees name could be modified to be more ‘public-friendly’. Conservation as a science is half about nature, and half about people, and I feel by solving the people side of this issue, there can be more headway made into issues faced on the natural side of things. It is worth noting that there are a substantial number of organisations designated to aiding in honeybee decline, and a separate conservation body devoted to the conservation of bumblebees (the bumblebee conservation trust, who do some amazing work) but no single body devoted to the other two hundred and forty eight species of British bee. If there were two hundred and forty odd British bird species that were potentially struggling and were important to large swathes of ecosystem functionality, they would be immediately earmarked for funding both from the state and public; to ensure that effective management and conservation work was carried out. In the same way we should not allow such charismatic invertebrate life (in the form of freedom bees) to fall through the cracks in ways that we would not allow other species to – especially given their economic importance. Figure 4. The rather gorgeous green eyed flower bee (Anthophora bimaculata) – just one of the species being overlooked. Wild Pollinators Enhance Fruit Set of Crops Regardless of Honey Bee Abundance – If you read nothing else – READ THIS PAPER! Thank you, this is a much needed commentary. I would like to cast my vote for ‘wonder bees’ as a replacement name for solitary bees, and I’d like to take issue with one statement you make. It is not clear whether honey bees act as ‘primary nectar robbers’, making holes in corollas to get at nectar as you describe. They are common visitors to these holes, but in virtually all reported cases, they are secondary robbers at holes made by other animals, including birds and bumble bees. Honey bees often change their nectar foraging behavior when these short cuts become available, which can make them less effective pollinators. If you know of credible reports to the contrary, I’d like to hear about them! Thanks. I’m glad you liked it. I agree – wonder bees is a much better alternative! When researching nectar robbing in honeybees I found it difficult to find adequate sourcing for this behavior, which I had heard about in passing in conversation previously. As such the sub-par sourcing on that section made me tempted to leave it out, but I am really glad you could clear this up for me! I have edited the article to be correct, as after a quick google search I’ve found a lot more credible information backing up what you say here than what I said in the article – so thank you! Should I find any sourcing indicating the formation of holes in the corollas by honeybees I will of course pass it onto you, but is is unlikely that I shall! However there a few things that need clearing up in your article, which I hope you’ll take as constructive criticisms. The economic values you give are for ALL pollinators, not just bees. A common lack of appreciation for the great value of wasps, moths, many flies and to a lesser extent some beetles and bugs (shame on you 😉 ). When you talk about bees extracting and attaining ‘honey’ I suspect you mean nectar. Nectar is the sugary liquid provided by plants, honey is what honeybees convert it into using chemical processes and evaporation (only honeybees make true honey).This is a common mistake but important to clarify. As well as flower visiting rates, much of the reason solitary bees are so much better at pollinating than honeybees is down to the different structures they have for collecting pollen and the way pollen is packed onto them (as explained in my blog article above and this one: http://beestrawbridge.blogspot.co.uk/2014/09/why-solitary-bees-are-such-amazing.html). RE Red listing: The IUCN have not yet assessed bees as a group, but there is a European Red List of Bees and 64 species of solitary bee are Section 41 Priority species in the UK (what used to be BAP species). However there are many more which are rare and/or declining. To be fair, solitary bees don’t really lend themselves to a single focus group since the species differ widely in their ecology and many of their requirements (e.g. nesting habitat) overlap with solitary wasps. It would be good to mention BWARS and Hymettus here who do important work towards research and conservation of aculeate hymenoptera as a whole. Sorry for such a lengthy comment but I thought you would appreciate some pointers since I see you have a burning passion for wild bees and are happy to respond to feedback. PS. My favourite term is ‘hermit bees’. It suits most species and might lead people to ask if they live in shells like hermit crabs, giving an excuse to talk about the amazing shell-nesting Osmia species. Irwin, R.E., Bronstein, J.L., Manson, J.S., and Richardson, L. (2010). Nectar robbing: Ecological and evolutionary perspectives. Annual Review of Ecology, Evolution and Systematics 41, 271–292. You’ll see that we catalog a lot of secondary robbing reports for honey bees, but couldn’t find any credible reports of them working as primary robbers. I have never seen it personally. DM me if you want a copy of this! Previous story Brownfields -Building plots or Biodiversity hotspots?